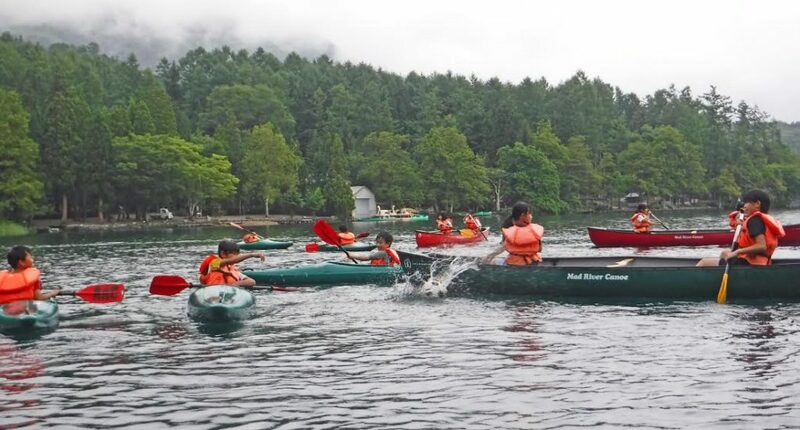 On June 7th, the fifth-graders in Aizome Elementary School came to Lake Aokiko to participate in the canoeing and kayaking tours. We had 4 guides, Koji, Lisa, Natsuki, and Yinfu, and I canoed with Koji as ground support staff. The role of the ground support is to keep eyes on customers and rescue them in case of flipping a canoe or a kayak. First of all, the guide taught the kids how to hold and use a paddle. Then, the kids also learned how to go straight and make a turn on a kayak or a canoe. Most of the kids had never tried canoeing or kayaking before, so I was worried about it a little bit at the first. However, after they had started paddling on a canoe or a kayak, they got the hang of paddling. Koji and I helped the kids who could not go straight or could not make turns. Koji gave them advice on holding and using the paddle to keep going straight. Those kids got better at paddling quickly, and Koji’s advice was easy for them to understand. I felt from this experience that I want to be able to give clear advice to customers when I guide them, and I need to learn and practice my guiding style through training over the next week. Since two people can ride in the same canoe, it is important to have good teamwork between those two people. Most kayaks are for just one single paddler, so the person in the kayak can decide to go wherever he or she wants. However, if one of the two people in a canoe paddles too hard, or the person in the back of the canoe doesn’t steer it, they can’t go straight. Today, the kids who had great teamwork went straight and made turns correctly! Good Job!!! Also, the bottom of a kayak is narrower than the bottom of a canoe, so kayaks can go faster than canoes. 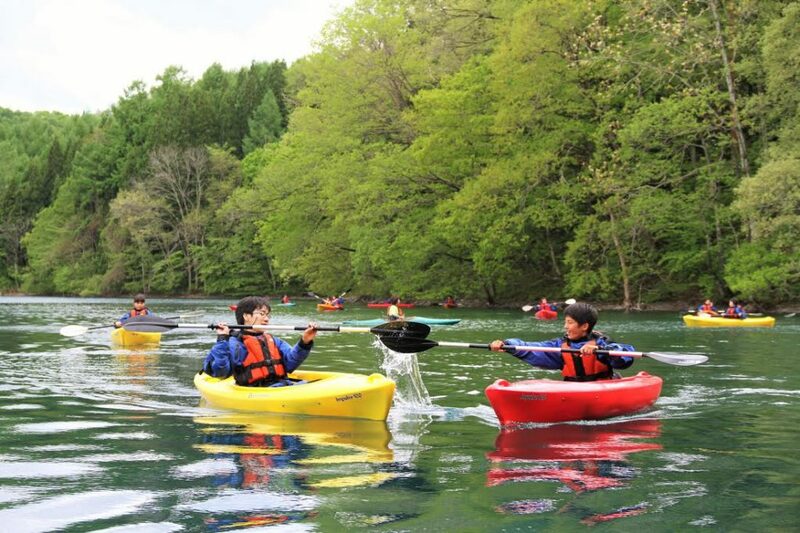 Canoes and kayaks have unique and fun in their own way and you can enjoy the paddling either of them if you join in an EOC tour on beautiful Lake Aokiko. 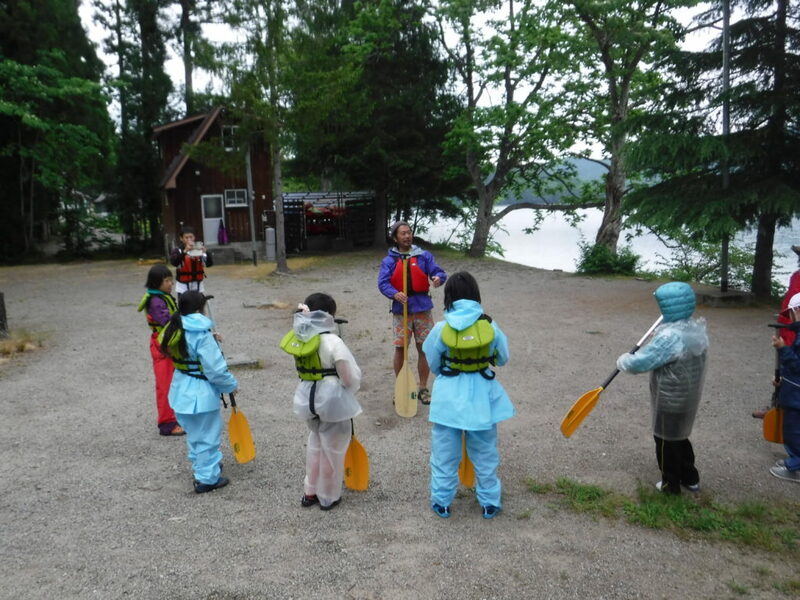 Today, it was cloudy and rainy, but the kids really enjoyed canoeing and kayaking on Lake Aokiko!!! Evergreen accepts group reservations, so if you are interested in the group tours like today’s tour, please contact us through the link below!! Also, if you are interested in the Evergreen canoeing or kayaking tours, please check the link below!! We are waiting for you to come to Evergreen! I know you will have an amazing time!!! !